An impressive router, but how come 802.1ac still isn't finalized? The Linksys EA6900 bears more than a passing resemblance to the EA6500 that we reviewed in December 2012. It's styled in the same dark grey and silver case, has the same flat, horizontally oriented design and the same curved section that juts out in the centre. When we looked at the EA6500, it was one of the first draft 802.11ac routers to fall into our hands, and was notable for its fast performance and high price. Fast forward 14 months, 802.11ac is still not finalised and the routers that support it are still fairly pricey. There are some key differences with this new model though. The three dipole (dual-frequency) antennae are now fitted to the outside of the device and it also has a dual-core 800MHz processor. A more subtle change is to the name on the front of the router. In March 2013, Cisco sold its consumer networking division to Belkin, who are maintaining the brand separately from its other product lines. The Linksys by Cisco label is now simply Linksys. Another feature of the EA6900 is support for 600 Mbps over 2.4 GHz wireless. This is achieved by increased QAM with supported wireless clients. The key word here is 'supported'. Non-Broadcom wireless adaptors will not run at the higher speed. The packaging is all the usual router fair. Inside the box, you get the router itself, its power adaptor, the antennae, a disc with the user guide in PDF format, a quick-start guide and a roughly 1.5 metre piece of ethernet cable. The antennae take a bit of tightening before they're securely attached. At the back there are four gigabit ethernet ports, plus another labelled internet for connection to either a separate modem or ADSL. There's a USB 3 port and a USB 2 port, a WPS button, a master on/off power switch and another button to reset the router to its factory settings. The default wireless SSID name and password are written on the underside. Not the default router password though (for reference, it's "'admin") which you'll need to remember at this stage if you choose to skip the setup process and set up the router manually. The setup procedure insists on a working internet connection. Before it does anything, it checks for newer firmware and updates the router. It then lets you choose names for each wireless network. It even explains the differences between 2.4 GHz and 5 GHz wireless. It then creates a new, unique router login password for use later. The next stage asks you to set up a Linksys Smart Wifi account. This is a facility for remote router management via the cloud. Sign in via the Linksys Wifi site or the mobile app, and you can administer your router over the internet, wherever you are. In practice, this is quite useful. With a bit of fiddling about you can remotely manage an FTP server this way, or quickly view the security logs, check on the status of connected devices and so on. But we're not sure cloud management of a home network is such a good idea, whether its Linksys or any other router company offering it. Since router security is far from watertight anyway, allowing remote management of your home network provides another potential way for hackers to access your computer. The main screen uses widgets not entirely dissimilar to those on Android. They provide a quick glance at the router's status and some of its functions. These can be removed, added and rearranged on the page however you prefer. These widgets partially solve the problem of having to remember which pages you need to trawl through to get at the information you need, which is a common issue with routers. You can quickly see the internet connectivity status, switch on the guest network or parental controls, check how many devices are connected, manage USB storage, and fiddle with media prioritisation. Renaming the wireless network is done via a simple drop-down box at the top of the page. There are still plenty of other advanced functions that require you to dig into the list of settings. Thankfully, these are organised in a fairly straightforward way, separated into one list labelled 'Smart Wi-Fi Tools', and another labelled 'Router Settings'. Port forwarding, DMZ, VPN, diagnostic tools and so on are all there. Thanks to the speedy processor in the EA6900 the pages load quickly, usually in less than a second, which makes it a lot less frustrating to use. There's support for 1300 Mbps 802.11ac, along with every wireless standard that came before it. 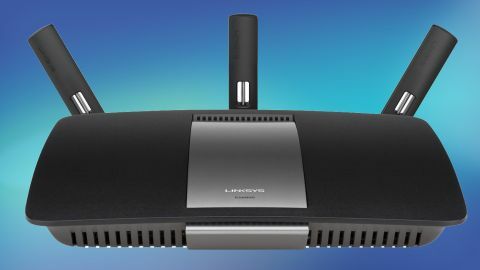 The Linksys EA6900 has a 3x3 antenna configuration, with each channel managing 433 Mbps. Unlike some routers, you can choose to have either 802.11n or 802.11ac on the 5 GPaulHz band. For testing, we used a desktop PC with an Asus PCE-AC68 desktop 802.11ac wireless card, since it's one of the few wireless adaptors to support 3x3 802.11ac. The router firmware version as of testing is 1.1.42. We connected another computer to the EA6900 and ran an FTP server. We transferred files back and forth wirelessly, first in the same room at a rough distance of 1 metre, then in a second room, with a wall in between. We measured transfer rates over 802.11n at 2.4 GHz and 5 GHz, and 802.11ac at its standard 5 GHz. These speeds are not bad. While some 802.11ac routers and clients can result in even higher performance, breaking the 40 MB/sec barrier over wireless is a decent result, better than anything you can get from 802.11n. We note that the results we recorded are slightly worse than those we measured from the older Linksys EA6500, but that can be explained by our use of a different wireless client, and different testing location, with thicker walls. The USB ports are surprisingly fast. Usually a router's USB port performs far worse than one connected directly to a PC's motherboard, but that's clearly not the case here, with some great speeds evident from our tests. We suspect this is another benefit of a fast dual-core processor. During testing the router showed to be reliable most of the time. We did run into a brief issue where no wireless client could connect to the router. After it had been reset to factory settings, we didn't experience the issue again. We also found that the router became quite warm during large file transfers. The Linksys EA6900 is powerful, its on-board software looks great and it's straightforward to use. Having a fast dual-core processor makes all the difference to performance. A few less seconds waiting for a page to load when you click a link makes it far less frustrating. Linksys provides a wealth of background information, video tutorials and guides on its website, should any of its users need additional help. The Linksys Smart Wifi cloud administration interface is useful and simple to use, although we're still unsure whether potentially compromising network security is a worthy trade for added convenience. It's slightly cheeky that Linksys didn't include two USB 3 ports, but one that's forgivable, given the USB 2 port is fairly nippy anyway. At £147, the Linksys EA6900 is significantly more expensive than most 802.11n routers, but all 802.11ac routers are generally still pricey. The Linksys EA6900 left us impressed. We wish 802.11ac was more widespread among laptops and more affordable, but that's a problem with the industry, not the Linksys EA6900. If you're looking to give your home network a performance boost, but can't face the idea of yet more wires trailed around your home, 802.11ac might be the answer, and the Linksys EA6900 could be a great starting point.